It's the most wonderful time of the year. The shops are looking festive, the Christmas markets are buzzing, and the Christmas lights are being switched on in towns and cities across Ireland. On Henry Street and Grafton Street, shoppers will be grabbing last-minute purchases on streets that are alive with the magic of Christmas. They might even struggle to drag the kids away with so much going on. But drag them away they must, because, for many people, Christmas means driving across Ireland to see friends and family and this means busy roads. The weekend before Christmas, around 40% of people in Ireland expect to drive over 20 miles homeward bound, as they finish work and indulge in last-minute shopping. Luckily, turn on the radio and a Christmas song will never be more than a few seconds away, to keep the festive cheer brimming over! 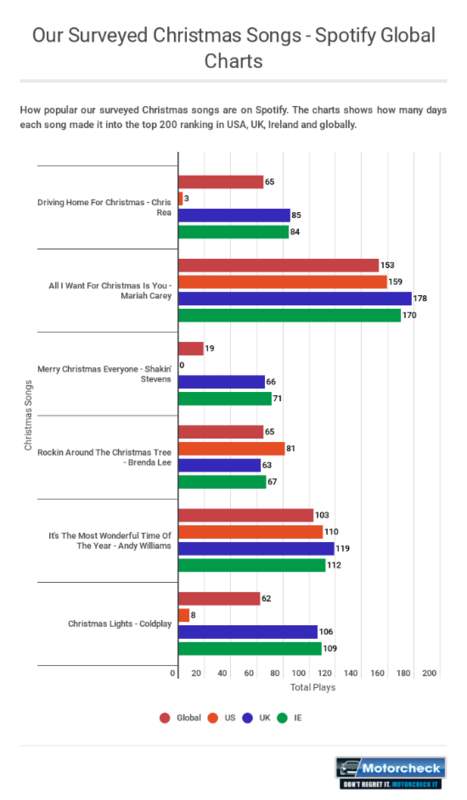 So, in the festive spirit, Motorcheck surveyed 1000 people, asking 'Which Christmas driving song do you love the most?' Can you predict the most popular answer in Ireland and do you agree? Ireland’s Favourite Christmas Driving Song Is…..
Nearly 30 per cent (29.8 per cent) of the people we surveyed said that Chris Rea’s ‘Driving Home for Christmas’ is their favourite Christmas driving song. A little known fact is that singer-songwriter Chris Rea wrote the festive classic in 1978 when he was down to his last £220. His manager had told him he was leaving him, and the record company wouldn’t pay for his rail ticket to go home to Middlesborough. There was only one way for him to get home for Christmas; his wife picked him up in their old Austin Mini. Some years later, he finished the song, but he never intended to write a Christmas hit. Mariah Carey’s ‘All I Want For Christmas’ took a close second place with nearly 24 per cent of the votes. Men and women don’t agree, however, and it seems the biggest disagreement between genders is with Maria Carey’s Christmas hit, which she released in November 1994. Women in Ireland love Maria Carey’s up-tempo Christmas love song, with 29 per cent of women saying it was the Christmas driving song they love the most. Only 17.7 per cent of men agreed. Men would much rather listen to Chris Rea’s dulcet tones. 32.6 per cent of men in Ireland said “Driving Home For Christmas” is their favourite Christmas song, as opposed to 27.1 per cent of women. The remaining songs on the list had a closer split of only three per cent maximum, which means that men and women are more likely to agree that they both like the song. We also checked the popularity of our surveyed songs on Spotify, looking at the top 200 songs streamed daily since October 2014 (non-consecutive days). ‘Driving Home for Christmas’ is the most loved Christmas song in Ireland. It’s also quite popular around the world, but not in the US. The song has only made the top charts in the US three times. Not surprisingly, ‘All I Want for Christmas Is You’ is a guaranteed success everywhere. The second favourite in our research, the song that was the most-played tune around the world of all the seven songs on our list. Mariah Carey’s track made the top of the charts (of the 200 most played songs worldwide) at least 150 times in Global, UK, IE and US charts. ‘Merry Christmas Everyone’ has scored a place in the 200 most played songs in Ireland 71 times in the last four years. The UK isn’t far behind with the song achieving 66 non-consecutive days over the top of the Charts. Conversely, this track has never made the top charts in the US and only achieved 19 days worldwide. ‘Rockin’ Around The Christmas Tree’ was the fourth most popular Christmas song, appearing in the top 200 for at least 63 days in Ireland, the UK, the US, and globally. The second most popular song out of the seven is Andy Williams’ ‘It’s The Most Wonderful Time Of The Year’. This classic track made the charts for 112 days in Ireland, and people elsewhere in the world love it just as much. Irish and British people love Christmas-style Coldplay. Their song ‘Christmas Lights’ had some success worldwide, making the top charts for 62 non-consecutive days. However, in the UK and Ireland, this number goes up to 106 and 109 days, respectively! Whatever your favourite Christmas track, we hope you get to hear it plenty over the festive season. Drive safely and have a Happy Christmas! Car safety – Keeping safe on the road this Christmas.